I love the way you structured this piece. Nice writing! I agree! You are a brilliant writer, incisive and compelling. This is a wonderful narrative. I see myself in your words and experiences. My condolences for your father and sister. I lost my sister tragically 2 years ago; I felt your pain. I almost lost my dad this summer to stroke; I was like you, at his bedside every day for as many hours as my job allowed. So sorry to hear that, Melinda – I hope you have made peace with her loss as best you can. Thank you so much for the kind words. You’re welcome. I am still working on making that peace. This is an awesome piece of age perspective ! Very well done! Thank you for sharing your experiences..
Second person. Wow. Tough thing to do well, but this is powerful stuff. Good work. It’s not amazing generate an imagination that could break barriers through the writing project. Thank you so much. I’ve been surprised at how much something so personal has resonated – good to know somehow. Take care and all best. Beautiful writing indeed. Thank you for sharing. Wow. Powerful. I read this 5 times and I’ll read it more. Have you thought of turning this into a novel? I think it would work brilliantly in the time sequence you’ve got here. Would love to read more about all of these experiences. Great work. Thank you Paula – I hadn’t thought of that actually but it’s an interesting idea. If I ever get the time, I may work on it. Many thanks for the kind words. Shivangi, susanne and theglobalsearch couldn’t be more right. Shades of Lorrie Moore. Nice riff and a poignant telling. Keep writing! You can be the same you wish. Its just what you believe. Its all in you and love the way you ended. You know… We worry about our future for no reason. Who knew as the 28 yr old, who was running around with her mom and sister to identify her eldest siblings dead body, that one day she will find peace… In writing! As the 12yr old new kid in the block in England, who had thought that she would have the same strange feelings of loneliness after her father leaves her. Who could have tell that there’ll be true love waiting at the end of these multiple ruining relationships! Life is about Now. Planning is one thing… But presuming a dark future or worrying about life ahead has always been more destructive than preparatory. Your writing evoked a wonderful perspective on life. hope you churn many such wonderful pieces of art till the of life as you know it. This post lays emphasis on two most important things in the life of a human being..
wow. just wow. i wish i could write like you. Very sweet to say and thank you – but you will find your own voice – just keep writing! Wow! Powerful stuff. I found myself identifying with a lot of it. I’ve not read anything written like this before and I’m intrigued by your writing! Dammit! You will make many people cry; retracing the footsteps of life. Life is an irony replete with peaks and valleys. This reminds me of a time when I lost a favourite aunt. Darkness, at the time; became my best refuge as I was left begging that night should go on and keep going forever. But hey, the sun has a mind of its own, it rises no matter our circumstances. In life you fall, you stumble, you trip but what matters is that to keep your sanity, you have to dust yourself off and face the light that the sun brings along with it, shining exposingly on your miseries, sorrows, secrets and so forth. This was beautiful yet emotionally provocative reading. Thank you so much. And yes, life goes on regardless – I’ve found that I’m very grateful for the aging process, by and large, and all the things you learn along the way. take care and all best. It is true. The aging process is inevitable though in our high-school-teen-years we tend to think age freezes for eternity. Happy new year to you, Sunnyrap. I have re-read your masterpiece, The Art of Wabi-Sabi this morning and I found it, just like the first time, very much a beautiful piece of writing. I have shared it on my Facebook page. Thank you for the kind words – happy new year to you too! Easy flow back and forth through time, just like the title that sets our minds on its course. Thanks! Reblogged this on The Flamboyance of my universe. Oh yay! For your beautiful complex post, your beautiful complex life, and this collectively beautiful messy journey. This piece is tear provoking. Beautifully written – straight from the heart! Thanks for the lesson of perspectve, full of wonder.. I went back and forth in retrospect and thought about events at specific ages. It has been quite a journey. Thanks for the quote and for stopping by Melba Christie and Poemattic. I found myself emotionally touched and intellectually fascinated by this post. Laying bare such difficult episodes feels very courageous and moving, while I find my mind wondering why the jumping timeline and why the second person voice? Hello – this piece wasn’t planned in any real sense – it was an accumulation of things I’ve thought for a while and happened to come out when I started focusing on writing again. The second person voice just seemed to make sense – it allows you that vital sense of distance perhaps and the jumping timeline also occured quite naturally – our memories are rarely linear in real life so I was unconciously mimicking that, I think. Sounds like words to kive by.. Sometimes you live different lives, in different ages and you just don’t know where you belong! I love your post! this made me feel almost at peace with myself, like I had a sense of coming home. A sense of happiness and joy. This is great for around the holiday times coming. So pleased it had that effect on you – happy holidays! Beautiful powerful and great written work .. I liked this entry, very delicately written. I am only 19 and feel as though I can relate to the entire piece. You probably hear this a lot but you have your whole life ahead of you. I was a terribly angst-ridden teen but – in case you’re struggling – it does get better and things do start to make sense : ) take care and all best. Sometimes it seems as though life is but a collection of memorable moments. Those moments mold and shape us. Some are good and some no so, but they are ours. Thank you for sharing some of your moments. God bless. Absolutely stunning. The “You are” drew me in again at each paragraph. Love. Life is a gloriously bumpy ride, nice write! The format alone is beautiful. Your piece reminded me why I love the movie “500 Days of Summer”. Wabi-sabi is right, and you have done it great justice here. Incredible. Please don’t ever stop writing, your voice is a gift. Such a comprehensive definition of what people go through to reach the starting of the cycle they initiated with a loud cry in mother’s arms. But so you still do black coffee and cigarettes? I’m just looking at the blog title after reading and it cracked me up… in a good way. I loved this. Your style of writing really pulled me in. Beautifully written story. Thank you Carmel. The age that a loved one dies is foreever imprinted in your brain so I was always struck by that detail about Jesus. I also see 33 as the age of transformation though – probably because of my own experiences. Happy birthday in advance to you anyway – all the very best! By far one of my fav reads on wordpress! Thank you Lee – that’s high praise indeed. Thank you for your beautiful words and memories and wisdom. It filled me with a certain kind of humility knowing that we cannot know what the future will bring– but that that needn’t be a bad thing. Quite the opposite. I’m glad it had that effect on you. Thank you very much. this is so incredibly beautiful. thank you for writing it and for being you. home is, indeed, where you are…no matter how long it takes to arrive there. Yes indeed – thank you! Beautiful… I got lost in your words.. A different world yet so familiar.. I began reading this and after a few sentences, witnessed time stand still. That is the mark of phenomenal writing. That is the mark of an exquisite gift being shared around the world from your pen to our hearts and minds. Thank you for this breathtaking, beautiful, pain-filled, freeing piece. Wow. Pingback: The art of Wabi-Sabi (or things you will learn later in your life) | Let's look at the bright side. this was incredible…made you feel something you didn’t know you could feel. well done. This is glorious, I had to wipe through so many shades of tears to reach the end, but it was beautiful to move through so much change so thank you so much. Life- a mysterious journey to don’t-know-where-to-go . The way you put it down is remarkable. Slowly, slowly i am coming home. This post is very intriguing! I love how you structured it also. very well written, wish you all the best! This was a very personal and affecting piece of writing. I guess we all have key points in our lives that have taught us something, even in a life as humdrum as mine. By the way, I’m impressed by how much you gave up at the age of 45. I never took to cigarettes or careless love affairs with careless men, so those wouldn’t be a problem, and I don’t care much about alcohol one way or the other, but I don’t think I’d ever be able to give up sugar. The thought is just too terrible to contemplate. I admire that you’ve worked out an approach to your life that works for you. I also like your philosophy about aiming for a degree of inner peace. It’s great, by the way, that you’ve managed to get off cigarettes. I don’t smoke myself, but growing up my grandmother and I were the only one of my extended family who didn’t. Even my younger brother smoked. Great writing.Almost like a life diary. I loved this article. https://teenagerdaysblog.wordpress.com/2015/11/22/bieber-fever/ Could you please let me know what you think? Thanks for your advice! I will definetely take it into account. I started to cry after reading this. Thank you for writing this. I’m 31 and have been married for almost 10 years. We are not doing well and I’m wondering if this is a turning point in my life. I feel like you do a lot of changing in your 20s and I think 30s will be similar and we are changing differently. I don’t think I’ve dealt with something more difficult than this and I’m glad I can read posts like this, to keep me sane. Hello you – so sorry to hear that. I stopped by your blog and you write very well, for what that’s worth. I was restless for a very long time and seemed to move constantly – I was always reinventing myself, I think, and there were lots of ups and downs. Getting older has been a blessing because it’s helped me understand and accept myself in my totality, if that makes sense. If you can, try and take some time out for yourself – a vacation somewhere, even a long weekend – or do something you’ve always wanted to do, to see how that makes you feel. You’re still discovering who you are and you may have some tough decisions ahead but in the long run, it helps to follow your heart and be true to yourself. As they say – it isn’t the destination but the journey. And as I always tell my younger friends, it does get better! with love – i wish you courage and strength. Enjoyed every word .. Every thought.. I love this. 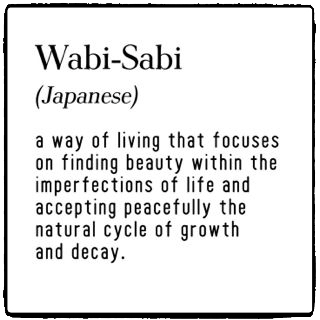 I wrote something on wabi sabi as well, i would love if you could take a look. Reblogged this on Clase CAP. This was incredible! Very inspiring and motivational. Thank you for sharing. This was a pleasure to read- and very absorbing. I did like the structure. Rarely does anything move me. This did… much appreciation to you. I get it. Thank you – very touched that it did. I sometimes miss the “old me” and adventures that seem so far removed from my current daily rituals. At nearly 39, it’s still difficult for me to “embrace peacefully”… my rebellious spirit is buried, but still there yearning for the chaos I (mostly) avoid. I’m more at peace with who I am now as I embrace my past experiences. Thank you for being vulnerable and sharing your truth. You’re welcome. I don’t know that our old mes ever disappear completely – like dormant volcanoes perhaps, they’re always lurking in the background. Good to know you’ve found a measure of peace though. Take care and all best. Wow. Do I know you? It made me feel as though I was reading into my own future. And similar past experiences. It also made me realize how short-lived my carefree life must be… Why I need to go do things that need to be done now. Great Post, all the greatest posts come from the heart and that definitely did! I made my blog yesterday, and I’m still in the exploring stage. I have skimmed a few pieces, but none of them have resonated with me- this is the first thing I have read from start to finish and truly enjoyed. I’m 18 years old, and I hope that one day I can write with as much poise and power as you do! Kudos to you for writing such an inspiring piece. I love this piece. I am 19 and I start reading again. This is the best I have read yet. Next year, I am 20… and I become focused in life. At school, I separate from the gang, quit smoking, no alcohol… New year resolutions. I will write next year and tell how things go. Very powerful, and extremely well written! Thanks for the read. Well worth it. This was so amazingly inspiring. Absolutely beautiful; touched many of my own memories, and brought many a tear. Finding it hard to express how much this touched me! Reblogged this on Thing touched me. Wonderfully worded. Terrific choice of words. I sure as hell love this piece. This is a great post. Well done! I’m doing a creative writing course at university and have literally just been reading about second person today so it was great to read this and put it in perspective properly. I can’t wait to be 45 years old after reading this. Couldn’t stop reading. Thank you. When I read each passage, I feel like it’s me. Thank you so much to all of you again for all the lovely comments – still very touched that so many of you can relate to this very personal piece. Love it!!! 34 going through similar things. That first quote really hit me home. Will share this in a very future post on my new blog. Thanks for sharing. Is there a chance you could give me a shoutout? I’m new here and it would be great for people to get to know me more? I’d be so grateful if it’s possible, thanks for your time 🙂 ! This is beautiful and really powerful. I was deeply intrigued. Thank you for sharing this. I was touched. Love this. Thanks for sharing yourself with the world. You are a great writer. I am a stickler for proper punctuation. Your blog is the first I’ve ever read. Forget Facebook! This is real reading material. I think I’ve found a new favourite! Beautiful piece! Keep ’em coming! Thanks for sharing this! It is an incredible piece! very creative and inspiring. went through similar experience with the death of my mom when I was 29. It’s never something you feel ready to face no matter how old, how wise or how experienced you are. But it made us grow. Thank you for the article. Emily – so sorry to hear about the death of your mum – i can’t imagine how painful that must have been. You’re right that you’re never ready – it’s something you realise all the time when you have an aging parent, as I do now. All best and take care. Wonderfully inspiring as I read this early in the morning. Thank you for this post. It has given me a refreshed perspective. I look forward to reading more of your writing. I have been going through so much anxiety lately. This is just what I needed. Beautiful stuff really. I read “You’re 39” almost 3 times. Thank you – and so sorry to hear about your anxiety – I hope you’re feeling better. Read this, I implore you. Reblogged this on Toko Langgeng. This is really beautiful. Thanks!! Reblogged this on Lirik lagu suka sama kamu. I found this so helpful to read, I done a post on anxiety a while back so I can know how it can be scary to put something like this online for people to see! Well done! Love the way you help us understand the experience of growing up. This is cleverly written. Reblogged this on Migno Site Official Blog. Many condolence. You write it very truthfully. Reblogged this on might as well live. Love the post! Thank you for sharing your experience. Great piece…love how you take us back and forth between times. Love the way you help us understand the experience of growing up. its a truth of life cycle..
Reblogged this on Musing /Snapshot /Inner Voice of a "Journalist". Wonderful… Love the way.. u structure/mention it. This is such a beautiful piece – not going to lie, I actually had goosebumps when I had finished reading this. I hope everything goes well for you. While I’m here I might just as well mention that I’ve actually just started a food blog, just writing wee things about dining out in places in Glasgow. Things have been tough for me over the last few years but food is something that has always brought me comfort (not necessarily a good thing hahaha). Would love it if you were interested and wanted to have a look or give me a follow, it would mean a lot. This is very poetic and meaningful. I wish so very much my blog was like this. Thank you – I’m sure I have at least 30 years on you though so I’ve had plenty of practice : ) Well done on starting your blog – you’ve got your own lovely distinctive voice, which will get better and better as you keep going. All the very best. What an incredible blog. So very well written. Very good read…so many parts resonated with my 38 year old self. Thank you! such a great blog !! I am in recovery and found this piece so, so moving. I am in the process of re-discovering myself and my talents that fulfill me and have found this process soothes and calms the soul. Thank you for reminding me we all have it in us. Yes! Love, in fact, is never enough. Thank you. Wabi-Sabi “hit” me after a brain hemorrhage. Particular words lodged themselves into my new brain: “The hoax (and arrogance) of normalcy and centrality” – I became the “Unlearning Specialist” at the School of No Media: http://SchoolOfNoMedia.com Cannot fall for much anymore…. Love the voice in this! I have a similar concept Ive been working on but from a completely diff perspective. Exciting to see this. *Chills* What a beautiful chronicle of hopes and pain, strung together like beads. It’s a shame women esp learn to take care of themselves after 40. Exquisite. (But you already know this. At least you should.) thank you. only a response of silence can suffice. but then you cannot see my silence, so i write to let you know how stunned i am. Your story remind me of my entire life. I was a person passion for perfection, I disliked the place we lived in the village where I used to have a lot of fun , I ashamed by my one year older brother who always been bullied but always stand out for me, I hated my parents can not give me a better life, then all of a sudden, God seems to hear my cursed, house collapsed, brother died, parent owed a lot of debt. I still think it was a dream, as long as I can find a way to wake up. So sorry to hear this – I hope things get better for you. Take care. Thanks. Yep, now I study in Wales ,have all the things I wanted before but never happy again. Wow. This blog post was so powerful and beautiful. You had me hooked throughout. I love your tone. Cool ! really like this.. This is the longing in my heart that one day, I’ll come home too. Beautiful writing! Thank you for sharing.I lost my first love 23 years ago, been through a divorce and few relationships after. This is good, a nice discovery. You and I venture down some of the same alleyways in our writing (including wabi sabi, oddly) so perhaps we will someday turn a corner and collide. You are an amazing writer. I rarely read anyone else’s blog and can’t even stand my own, but your wabi sabi story drew me right in. I think I experienced every emotion possible in the short time it took to read it. Thank you! Reblogged this on farahtariq's Blog. Beautiful. Your words touched me. Thank you. Welcome home ! a quality piece of writing . You are 27 when your alcoholic depressed father kills himself. You are a catholic family so the preast refuses to bury him. You start to wonder how far you can travel to get away from it all. It turns out, far far away is not far enough. I wish I can write as good as this. Very nice. Very well written and riveting! I, too, love the way you structured this and the second person voice. Even though I live halfway across the world and am a West Texas gal, I could identify with so much that you shared. Thanks for sharing your story with such honest vulnerability! Beautifully written! I hope to one day write as well as you. I hope you don’t mind me quoting you in my (wallow) blog (not sure when I will write it yet, but I intend to). I will give you full credit. This is so very beautiful. I love it so much. You capture the truth that we all live and learn beyond time. Cried. 28 & right there with you. Present, past, & future.. Thank you for this. I am 45 this year and I too have started to think about family who have gone ahead and where my place on earth is. An alignment of priorities and the reason for being. In my head, I am giving you a standing ovation. Beautiful writing. Was teary at the end. Fabulous! You have an excellent flair for taking your readers on an engaging, reflective journey. I look forward to returning here again. Love how you’ve so neatly captured what it means to be human through your reflections. What a lovely post. Every woman could relate. I started coming home at age 41. And yes, part of it are yoga, meditation and writing. Thank you for sharing with us your life experiences. Moving stuff, it almost felt too personal to read. thanks for sharing such a touching extract! great message! I think ‘coming home’ is often something that happens later in life, but whenever it happens, it’s a good thing. Very glad to hear of your experience – all the best for the future. So beautiful and heart wrenching and tremendous. I loved this. Why all sad posts decide to show up on my timeline now? Brilliantly written narrative, heartfelt tale. I loved it. Thank you so much, Jasmine. WOW! That’s all I can say. I truly loved this. You are so talented and inspiring. Thank you very much for that powerful piece of writing. How insightful, direct, and strong! It gives hope for a future at peace with oneself. Thank you for this. You’re very welcome – thank you for the kind words. That’s a wonderful piece. Sometimes when things are falling out of place, they are usually falling in place. We are not home until our hearts decides to cherish the moments. I am only 12 th year old when I first fall in love with me classmate .But till today I could not forgot her .According to Myself TRUE LOVE was/is/will only one: i.e., trustable. Reblogged this on Kiss and Hide. Reblogged this on TIISETSO K. MONTSHOSI. Thank you so much – and to you. Thank you for this beautiful, honest entrance into your soul. I am blown away. Better than any novel I’ve read in a long time. Very late – my apologies – but thank you so much.